The Velocity frequent flyers program was the financial jewel in an otherwise mixed half-year for Virgin Australia, which reported its results today. The airline reported a 14 per cent lift in Velocity program revenue to $176.4 million in the first half of the year to 31 December 2016, although underlying EBIT was down slightly to $66m. Notably, the program exceeded 7 million members in January, six months ahead of the financial year target, representing a 78 per cent increase in the membership base over the last three years. Virgin said the average membership growth rate was 3300 people per day over the first half. Virgin appointed its first dedicated CMO for the frequent flyers division, former American Express VP of customer acquisition and product development, Dean Chadwick, in December. Other initiatives over the past six months included the new ‘Pay with Point’ scheme, which allows members to redeem dollars off eligible fuel and store purchases at participating BP petrol stations nationally. The rest of the financial results were less positive, with Virgin reporting a pre-tax underlying profit of $42.3m for the half-year, a decline of $39.2m. The group also filed a statutory net loss of $21.5m, attributing a large part of this to restructuring charges related to its ‘Better business’ initiatives and fleet simplification efforts. Total revenue was also down by 0.9 per cent to $2.65bn year-on-year, a result that reflected subdued trading conditions in the domestic market and a drop in yield of 5.6 per cent, the company stated. On a more positive note, the group reduced net debt by $936m to $1.169bn over the period. 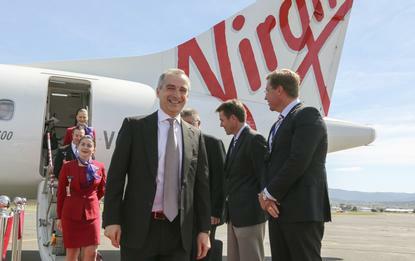 Virgin Australia group CEO, John Borghetti, chose to highlight the group’s stronger liquidity and cash position, reduction of net debt, and its implementation of the ‘Better Business’ initiatives in his presentation to investors. International expansion is also on the cards, and Borghetti noted the forthcoming launch of flights from Australia to Hong Kong through its new alliance with HNA Aviation, Hong Kong Airlines and HK Express, as well as between Melbourne and Los Angeles, as examples. Virgin declined to provide further guidance on its full-year results, blaming uncertainty in external market conditions.